For Joey Buitron, participating in Sunday’s McAllen Marathon relay with his family is about more than just a race. It’s a celebration of an active lifestyle he attributes to helping prepare for his unexpected fight against Acute Myeloid Leukemia. In 2016, when Joey was training for the Chicago Marathon, he experienced extreme fatigue that didn’t allow him to finish his runs. The avid runner thought he was overtraining. But a visit to the doctor and blood work revealed an abnormal platelet count. He was diagnosed with AML at MD Anderson Cancer Center in Houston. He received six rounds of aggressive chemo. Joey’s wife Iris would sometimes worry about him, when he looked particularly weak, as he made his round on the hospital floors. Even through his treatment, he’d try to get a mile in daily, she said. “I felt like it was good for his spirit, and mine too,” Iris said. Running during chemotherapy was a “testament to this strength. “I’d feel guilty if I didn’t because there he is, and I’m perfectly healthy,” Iris said. “I’d pray the whole time for him to get better,” her voice starting to break. Joey only started running about seven years ago because Iris signed him up for the Rock ‘n’ Roll Half Marathon in San Antonio to run with her, without his knowledge. “‘Okay. Well, it’s time to train. Let’s do it,’” he laughed. Since then, they were hooked, they said. At MD Anderson, she remembers feeling for older or frail patients they’d see, because she’d seen the wear the chemicals inflict on a healthy body. “It just hurts, because you know what they’re up against,” she said. “His heart was so strong that it was able to withstand the chemo. Joey always valued his time on runs. Before cancer, it was his opportunity to himself to entertain the things that popped into his head, he said. And like his post-chemo body has changed — cruising at a slower pace and his muscles taking longer to recover — so has his approach to the mental game of distance running. He uses his running time to meditate and talk to God, he said. 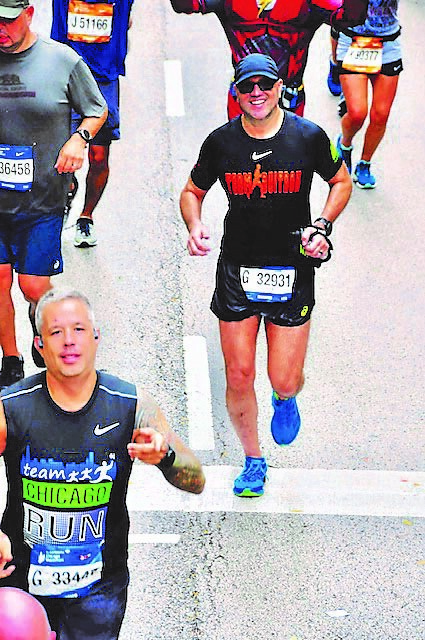 This year, Joey finished his Chicago Marathon. He attributes his success — in health and running — to his family and friends coming together in his time of need. He confessed he didn’t know what 100 percent is for his post-cancer body — if he’d ever feel exactly the way he did before. But this isn’t stopping him. Joey, Iris, one of their sons and Joey’s brother are part of a McAllen Marathon relay team. Because he feels running was crucial in his recovery, he’s out there to promote a healthy lifestyle and tell his story. Joey said he loves to run in McAllen event because it’s home, especially because of the obesity rates. “We really need to get people to come out,” he said. “Yes, it’s hard work in the very beginning. But once you get through it, we enjoy it. Amanda A. Taylor contributed to this report.